Locally administered corticosteroids have been widely used in the treatment of inflammatory eye diseases. Posterior subtenon triamcinolone acetonide injections have been used in patients with varied indications with good therapeutic response and ocular tolerance. There are known potential complications of the injection including steroid induced rise of intraocular pressure. In our prospective study, its safety profile in northeast Indian population was studied. Overall complication rate was found to be 5.32% in 507 injected eyes and steroid induced ocular hypertension was noted in 2.17%. All the complications were transient and reversible. 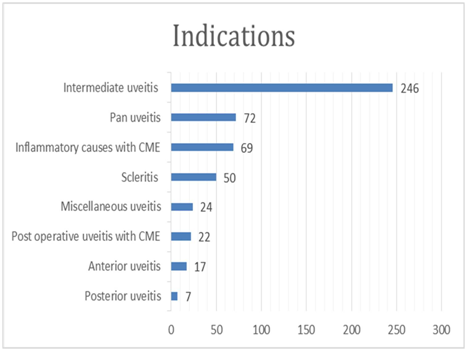 In this prospective, interventional, case series one uveitis expert conducted the investigation in an institutional set-up. Study was carried out from March 2009 to November 2014 in a tertiary institute of northeast India after ethical clearance from the Institutional Ethics Committee. All injections (40mg, 1.0mL of non-filtered Triamcinolone acetonide) were given with a disposable syringe, 25 gauges, 5/8-inch in supero-temporal quadrant (recommended by Nozik­)5 after the informed oral consent from the patient. Topical anesthesia applied for one minute in the lower conjunctival sac in each of the case. Patient was asked to look away from the site of injection. Upper eyelid was elevated and cotton swab soaked in topical anesthetic drops placed over the injection site for about 15-20seconds. Bulbar side of the conjunctiva was chosen for the injection entry because of more visibility and more firm attachment to the Tenon’s capsule in that area so that sub-tenon’s space could be reached early and accurately. After everting the eyelid, penetration of needle was done in the bulbar conjunctiva (2-3mm from fornix) with the tip of needle’s bevel end facing towards the globe. Needle was inserted posteriorly while following the curvature of the eyeball, keeping a close look to the globe and the limbus. Wide side-to-side motions were done while the needle advanced gradually in sub-tenon space. Movement in the limbus during the side-to side movements would mean that we have penetrated the sclera which was undesirable. When needle had reached to maximum, twisting of the needle was done circumferentially until the bevel end reached the edge of the sclera. Plunger was withdrawn to see if any blood was coming out. If not then drug was injected in the posterior sub-tenon space. No white swelling was visible at the injection site in most of the uncomplicated cases. First post-injection check-up was done on 15th day. Patients were followed up for at least 3months after receiving the injections. All complications associated with the injection itself were noted. Pre-injection and post-injection IOP was measured with Goldman explanation tono meter. Most of the patients had been treated previously with topical and systemic steroids and the included eyes did not react with excessive increase of IOP. Total numbers of 507 eyes were included in this prospective study, out of which 255 were male and 252 were female. Main indications for the injections were intermediate uveitis (49%), pan-uveitis (14%), varied inflammatory causes with cystoids macular edema (CME) (14%), scleritis (10%), miscellaneous uveitis (5%), Post-operative uveitis with CME (4%), anterior uveitis (3%), posterior uveitis (1%) as shown in Figure 1. Figure 1 Bar diagram showing the different indications where PSTA were given. 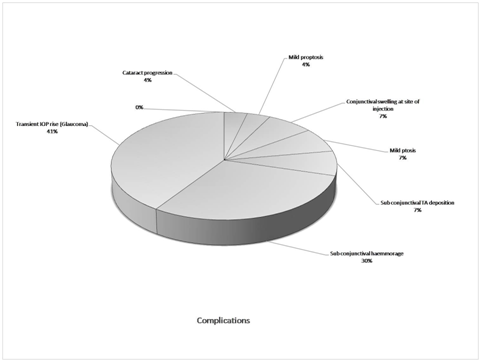 A total number of 27(5.32%) complications were noted which includes steroid induced ocular hypertension(SIOH) (11), Sub-conjunctival hemorrhage (8) Mild ptosis (2), sub conjunctival drug deposition (2), conjunctival swelling at site of injection (2), mild proptosis (1) and cataract progression (1) as shown in Figure 2. All the complications were transient and reversible. 7 out of 11 patients of SIOH needed anti glaucoma medications to control the IOP. Highest IOP recorded among these patients was 42mm Hg at 2nd week post injection. Average of pre injection and post injection IOP of these 11 patients was 15.3mm Hg and 29.5mm Hg respectively. Repeated injections were given in 4 cases twice, in 2 cases thrice and 2 cases for 5 times in the same eye. No rise of IOP or other complications noted following the repeated injections. Figure 2 Showing different complications following PSTA. In our study, SIOHs were noted in 2.17 % of injections. Patients with prior history of rise of IOP following topical or oral steroid therapy grouped under historical steroid responders were not included in the study. In a study by Levin D S et al.,10 rate of recurrent intraocular pressure elevation in non-responders was 13% which higher than our study (2.17%). The highest recorded post injection IOP among our entire patient was 42mmHg. In 5 cases, Dorzolamide and Timolol combination eye drop (for IOP >28mmHg) and in 2 cases Timolol 0.5% eye drop was given. In 5 cases, IOP was controlled by 3weeks, 4 cases by 6weeks and in one case, IOP was controlled in 12weeks time. 1 case was lost to follow-up. No delayed onset of increase in IOP was seen unlike other study.11 Akduman L et al.,12 suggested that patients who received sub-tenon injections of corticosteroids may not respond to maximal anti-glaucomatous therapy so excision of the depot is required to control the raised intraocular pressure (intractable glaucoma).But in our series, no surgical excision of depot steroid was required. There was no significant difference in IOP elevation according to disease type. Mild ptosis were seen in 2 cases and in one case, it persisted for 6months. In one case, cataract progression with slit lamp bio-microscopic finding was noted and compared with vision at 6week and 12week. Other complications such as sub conjunctival hemorrhage and conjunctival edema were managed conservatively. PSTA injection is an extremely safe procedure given the proper patient selection. Injection can be repeated without significant complications. SIOH is a transient complication and raised IOP can be controlled with standard anti-glaucoma medications and proper follow up. Sri Kanchi Sankara Health and Educational Foundation. Forster DJ, Rao NA, Smith RE. Corticosteroids in the treatment of intermediate uveitis. Dev Ophthalmol. 1992;23:163‒170. Becker B, Mills DW. Corticosteroids and intraocular pressure. Arch Ophthalmol. 1963;70:500‒507. Coles R, Krohn D, Breslin H, et al. Depo-Medrol in treatment of inflammatory diseases of anterior segment of the eye. Am J Ophthalmol. 1962;54(3):407‒411. Morgan CM, Schatz H, Vine AK, et al. Ocular complications associated with retrobulbar injections. Ophthalmology. 1988;95(5):660‒665. Nozik RA. Periocular injection of steroids. Trans Am Acad Ophthalmol Otolaryngol. 1972;76(3):695–705. Giles CL. Bulbar perforation during periocular injection of corticosteroids. Am J Ophthalmol. 1974;77:438‒441. Dal Canto AJ, Downs-Kelly E, Perry JD. Ptosis and orbital fat prolapse after posterior sub-Tenon's capsule triamcinolone injection. Ophthalmology. 2005;112:1092–1097. Spierer A, Schwalb E. Superior oblique muscle paresis after sub-Tenon's anesthesia for cataract surgery. J Cataract Refract Surg. 1999;25(1):144–145. Mueller AJ, Jian G, Banker AS, et al. The effect of deep posterior subtenon injection of corticosteroids on intraocular pressure. Am J Ophthalmol. 1998;125(2):158‒163. Levin DS, Han DP, Dev S, et al. Subtenon's depot corticosteroid injections in patients with a history of corticosteroid-induced intraocular pressure elevation. Am J Ophthalmol. 2002;133(2):196–202. Herschler J. Increased intraocular pressure induced by repository corticosteroids. Am J Ophthalmol. 1976;82(1):90–93. Akduman L, Kolker AE, Black D, et al. Treatment of persistent glaucoma secondary to periocular corticosteroids. Am J Ophthalmol. 1996;122(2):275‒277. © 2018 Das et al. This is an open access article distributed under the terms of the Creative Commons Attribution License , which permits unrestricted use, distribution, and build upon your work non-commercially.